SCBS' primary program focuses on the development and maintenance of water sources and habitat improvement in the California deserts, including state and federal lands, military bases and mitigation areas. SCBS members and volunteers perform surveys to determine site specific requirements, construct new water holding facilities, enhance existing water source, clear tinajas, and eliminate non-native tamarisk and other invasive vegetation. With a reliable water source and a secure location, desert bighorn sheep and other wildlife species are attracted onto the new ranges. 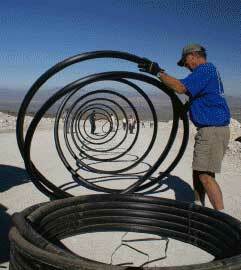 SCBS members monitor and maintain each site to ensure a permanent year-round water supply. To date, over 70 wildlife drinkers and countless natural springs have been constructed and maintained, and many others are planned. 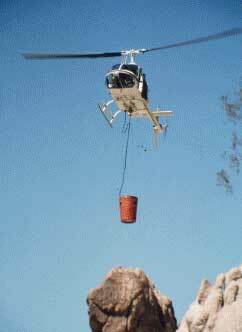 The typical wildlife drinker project takes place in extremely remote terrain, often necessitating the use of helicopters to shuttle in supplies, equipment and workers. Most projects are completed within a week, with the majority of the physical labor taking place over a two-day period. Not including the hundreds of hours of labor contributed by SCBS and its volunteers, the cost of the average installation is about $35,000 to $40,000. SCBS and the California Department of Fish & Wildlife (CDFW) have an ongoing program in place to restore desert bighorn sheep to the California desert and mountain ranges. This effort involves the capture and translocation of the bighorn into areas where water sources have been reestablished and ranges enhanced. It is anticipated that the transplanted sheep will establish viable populations in the new ranges and supplement remnant groups, thus restoring vitality to the herd and assuring perpetuation of a strong and healthy species. During the capture process, the sheep are given a complete medical examination by DFW biologists. This procedure helps determine the general health of the herd and alerts wildlife management agencies to any developing programs that may affect the success of the reolcation project or the herd in general. 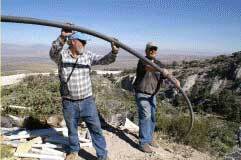 Like the water for wildlife project, the translocations are expensive. The average project, involving about twenty sheep, costs approximately $50,000 plus. SCBS has helped supply volunteers and funding to help offset the costs associated with capture and translocation programs.